Don José de Arnaz' Nineteenth Century holdings in the old Rancho Rincón de los Bueyes made up a two and a half square mile ranch in what would be West Los Angeles . Into 1939, one half square mile of the Arnaz Rancho remained farmland. In 1949, the county district of "Arnaz" (already homes) was incorporated into the City of Los Angeles, all but ending the100 year arc of the Arnaz name on the land. ( Romance of a Rancho) The plat (shown below), "Finally Confirmed to Francisco Higuera et al.," was recorded on October 12, 1872. 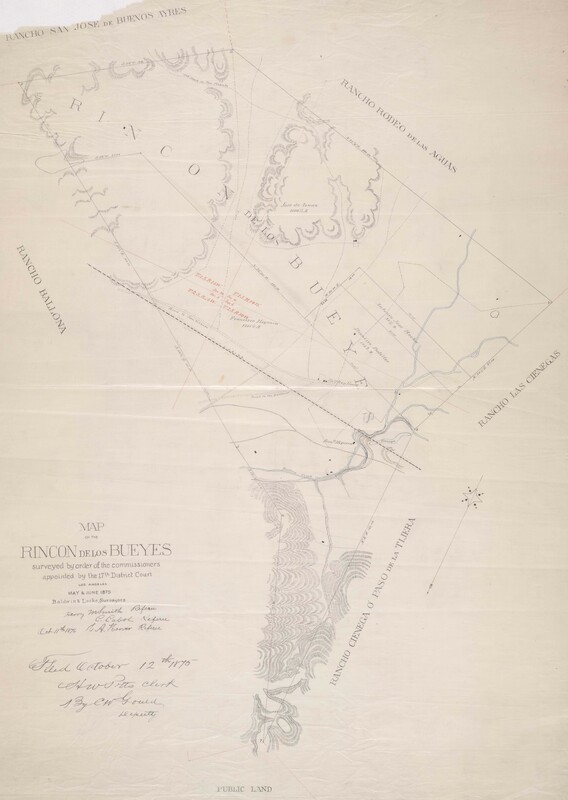 Plat of the 3127 acre Rancho Rincón de Los Bueyes as approved by the United States Surveyer General (December 29, 1871), approved by the Commissioner of the General Land Office (August 22, 1872), and recorded (October 12, 1872). Soon after the court's decree, in May and June 1875, the Rancho Rincón de Los Bueyes was "Surveyed by order of the Commissioners appointed by the 17th District Court Los Angeles." The survey shows José de Arnaz with 1506.23 acres, Francisco Higuera, 1355.1 acres, Dionisio Botiller with 172.9 acres, and Antonio Jose Rocha with 88.75 acres. The "L. A. & I. R. R." shown is the Los Angeles and Independence Railroad . 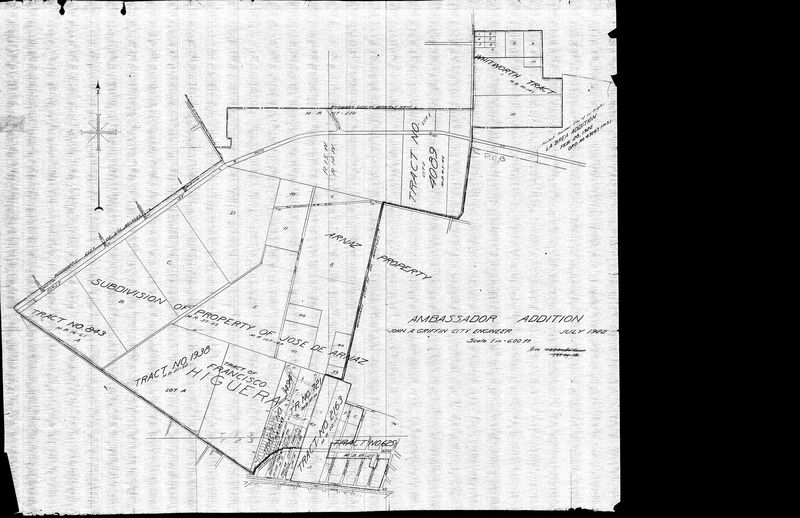 This Francisco Higuera tract map was filed on June 15, 1880, "at the request of A. W. Ryan." 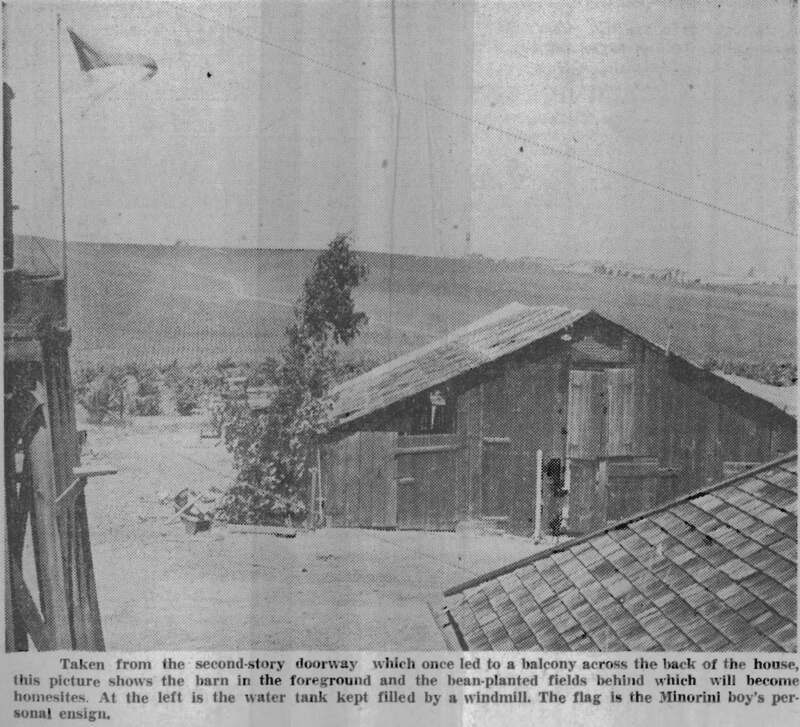 "Hill Land" at left is now the Cheviot Hills subdivision ; "Rough Hills" at the right reach up into Baldwin Hills. ​​The following map (displayed in two parts, west and east) "recorded June 24, 1889 ... at the request of Jose de Arnaz" shows Arnaz' subdivision of the 1506.23 acre Arnaz Ranch on Rancho Rincón de los Bueyes. The larger lots (A through E) of hilly land to the west had parcels ranging between 73 and 126 acres. The smaller lots, on flatter land to the north and east, were generally 20 acres. The road between lots 32 and 21 is Arnaz Avenue, now Robertson Boulevard. The road immediately west was Anguisola Avenue, which was vacated in 1906 . Western portion of Don José's subdivision, which included hill and larger lots. Higuera's land is below the numbered and lettered lots. ​​​Eastern portion of Don José's subdivision (with Higuera's tract beneath it). Adjacent to Lot 26 is "adobe," signifying Antonio José Rocha's adobe – which survives to this day . 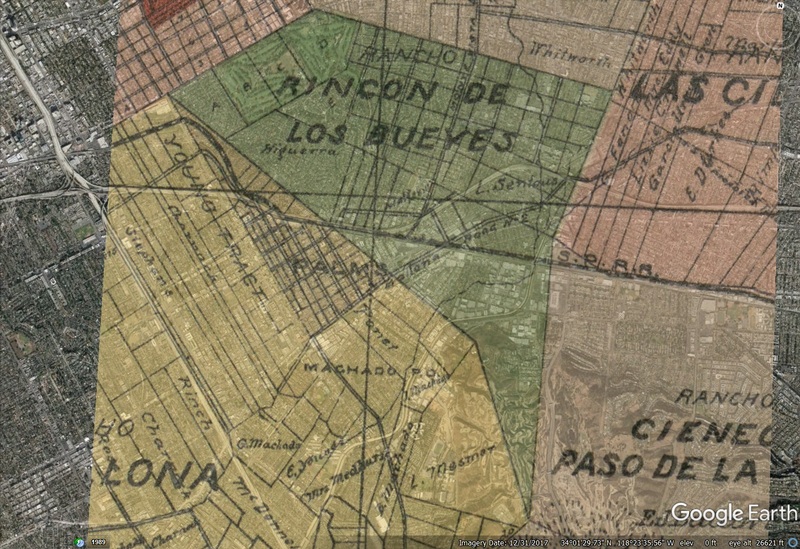 Rancho Rincón de Los Bueyes from official 1888 Los Angeles County map overlaying modern Google Earth map. It shows Arnaz' subdivided Lots A-E at upper left and Higuera's land beneath them. Louis Sentous (1848-1911) appears to have succeeded to much of the Rocha and Botiller land beneath Arnaz' easternmost lots. Before his death at the age of 74, on February 1, 1895, Don Jose had drawn a will dividing his rancho into two parts. He drew a line bisecting the rancho approximately north and south, along the eastern boundaries of what today is the Hillcrest Country Club. All west of this line went directly to surviving children by his first wife; all lying east of the line went to his widow to be held in trust for herself and her surviving children. .... They received shares varying from 80 acres to 200 acres, depending upon the value of the land, whether it was level or hilly, watered or dry. These shares, totaling over 1000 acres, they disposed of at different times to different parties. Mercedes' heirs sold their property soon after the April 1896 partition. On May 21, 1896, Merced Abila's inheritors conveyed Lot E for $4500 (about $44 per acre) to Arthur F. Gilmore; on May 27, 1896, Gilmore got Lot A for $3640 (about $35 per acre) ; Lot B for $3640 (about $35 per acre) ; and he took Lot C on July 29, 1896, for $4700 (about $45 per acre) . Gilmore (1850-1918) was a dairy farmer who had struck oil while drilling for water. His son, Earl B. Gilmore (1887-1964), developed Gilmore Oil Company. The family still owns Farmers Market at Third and Fairfax . In July 1905, Arthur F. Gilmore (through his agent Charles Stilson) sold Lots B, C, and E to the Burkhard Investment Company (a family corporation formed in 1912 by Joseph Burkhard (1848-1928)) for about $200 an acre. Lot A holds part of the Country Club Highlands tract. Lots B and C would become the bulk of today's Cheviot Hills Recreation Center – after passing through a few more owners. Most of Lot E would make up the Monte-Mar Vista subdivision. Lot D and and the northern portion of Lot E would hold the Hillcrest Country Club. Given subsequent oil drilling, it would be interesting to know if oil rights were part of the sale. Like their half-siblings before them, Arnaz' heirs by his second wife, Doña Maria Camarillo de Arnaz, largely waited for the land to be partitioned by a court before selling it ten years after his passing. In the interim, Doña Maria "continued raising cattle, making wine, and growing grain, aided by a trusted foreman named Olvera." ( Romance of a Rancho .) The partition case, entitled Maria C. de Arnaz v. Louis G. Olivaris, may have been prompted by Louis Olivaris' lease on the property (reported in the Dec. 13, 1900, L.A. Herald under the heading "Attachments"). Shortly after the case concluded on June 8, 1905, with the court's approved distribution, the heirs started selling. By a decision handed down by Judge Bordwell yesterday in the Arnaz case, the rancho Rincon de Las Bueyes, one of the finest pieces of farming property in the southwest, was finally distributed and a complete and amicable settlement made between the heirs of the late Don Jose de Arnaz, who died February 1 . The Arnaz property consists of about 800 acres of farming land on the electric line between Los Angeles and Santa Monica. The electric line cuts through one corner of the property, leaving 86 acres on the one side and a little over 647 acres on the other. When Senior [sic] Arnaz died, seven heirs laid claim to the property, which, according to court value, is worth $140,000, but which according to real estate men is worth a great deal more. At the same time, L. G. Olivaris entered action for $1500 mortgage on the property. John Wolfskill, John B. Arnesty and John B. Sanchez were appointed referees and their opinions formed the base of the decision given yesterday. The following maps show the partitioned ranchland .
" 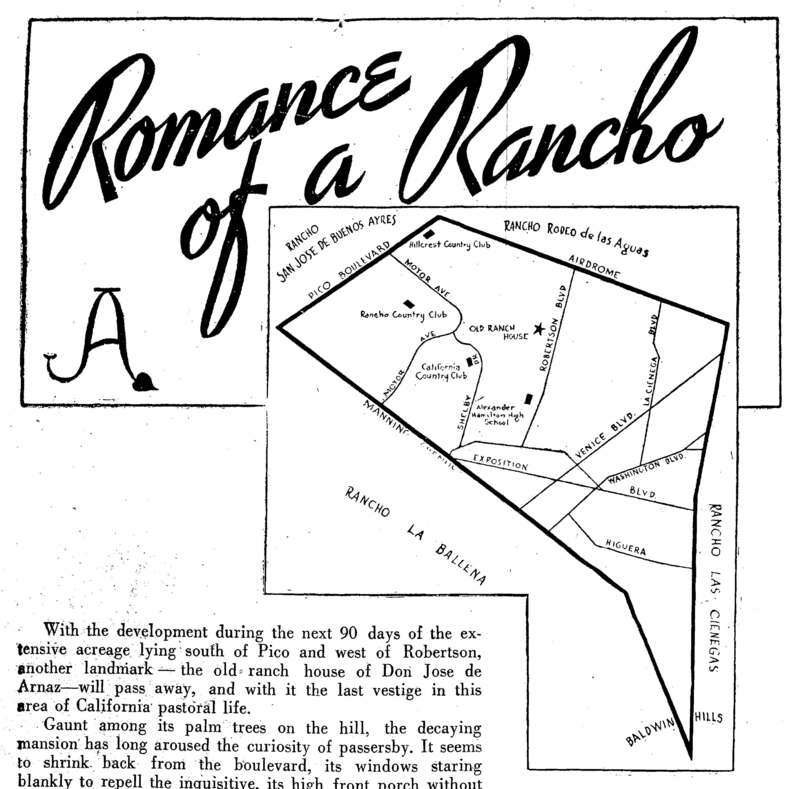 Romance of a Rancho " has the Rindge/Marblehead Land Company interests buying the Arnaz ranch in 1904. ("In 1904, with court approval, she sold the property to Mrs. Ringe for $125,000, of which the court awarded her $40,000, the remaining $85,000 being divided among her children in proportion to the value of the tracts Don Jose had set aside for them.") 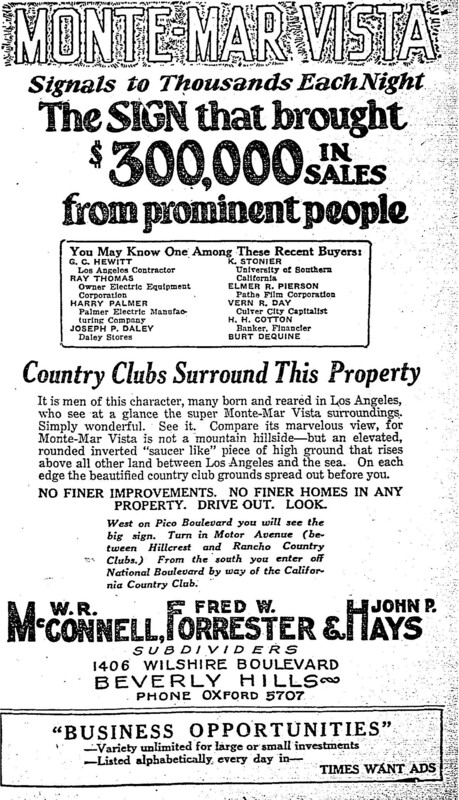 The Los Angeles Times told the same story: “‘The new [Beverlywood] development was conceived more than a year ago when a syndicate of local investors acquired the noted Arnaz Ranch from the Marblehead Land Co., which had held ownership since 1904,’” Leimart explained.” ( LA Times, June 2, 1940 .) T his writer has not located that 1904 sale, and it is unlikely that expensive/large a parcel was sold before the 1905 partition. 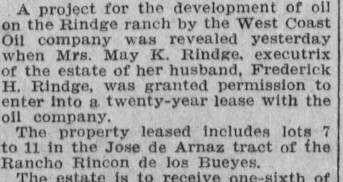 Instead, there was a $125,000 sale on June 25, 1905 , when R. C. Gillis, "one of the principal land owners between Los Angeles and the ocean" bought the 625 acre Arnaz ranch "through Leo J. Maguire & Co. for Maria Carmarillo [sic] de Arnaz and her children, heirs of the late Don Jose de Arnaz." A couple of days later, on June 27, 1905, the same paper reported that "Edward F. Tripp and associates have paid R. C. Gillis $140,000 for the Don Jose de Arnaz rancho of 625 acres. .... Mr. Gillis bought the acreage last week for $125,000. The purchasers will subdivide and improve the property." 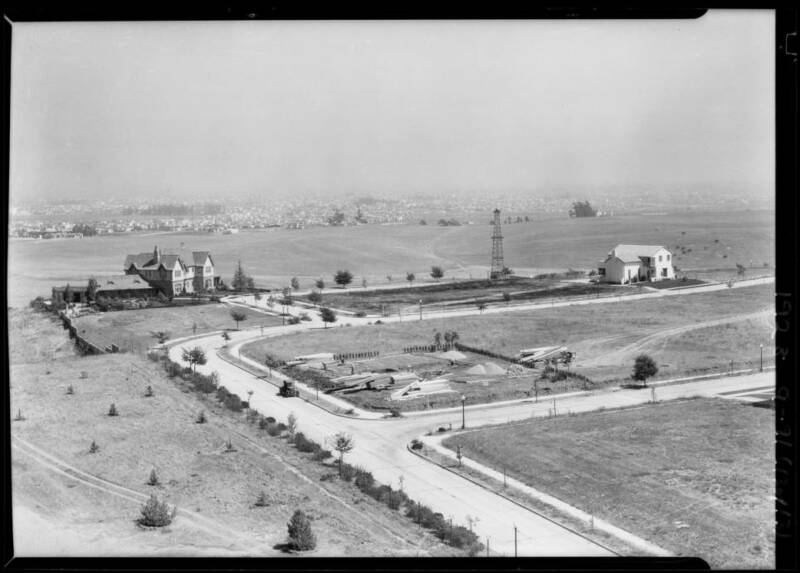 In the mid-1920s, the Marblehead Land Company developed the Westview Park neighborhood, Tract 8020 (a resubdivision of Arnaz' Lots 2 and 3), offering residential and business lots north and east of the $500,000 creamery it was building on fourteen acres of its Arnaz Ranch land. 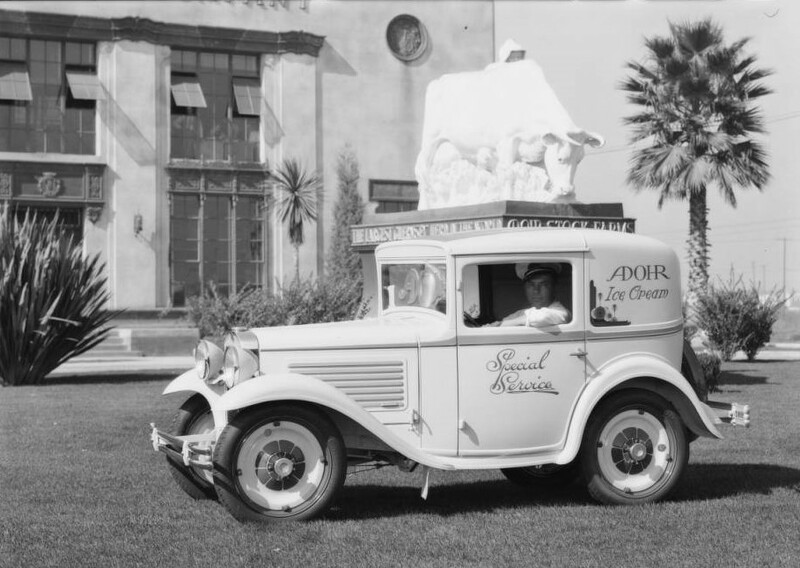 "Centering around the new Adohr Creamery, now rapidly nearing completion, a community development calling for an expenditure of more than $3,000,000 is planned for the historic old Arnaz ranch" reported the L.A. Times on May 30, 1926 . 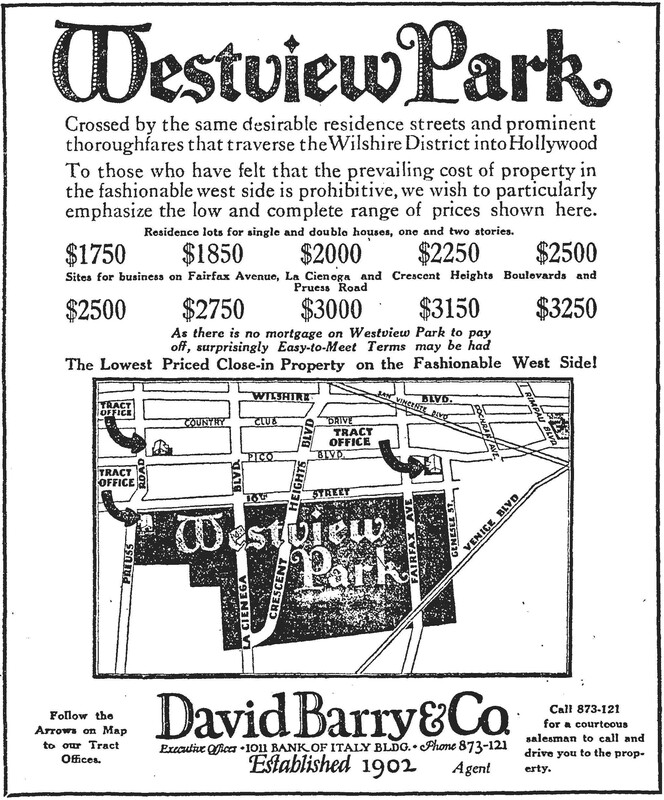 February 17, 1924, full-page Westview Park advertisement in the Los Angeles Times. The "owners" of the creamery were the daughter and son-in-law of Frederick H. Rindge (1857–1905): Merritt H. Adamson (1888–1949) and Rhoda A. (Rindge) Adamson (1893-1962). "Between 1905 and 1940 with an estimated net worth of between US $700 million and US $1.4 billion, the Rindge family was widely considered one of the wealthiest in the world." ( Wikipedia .) 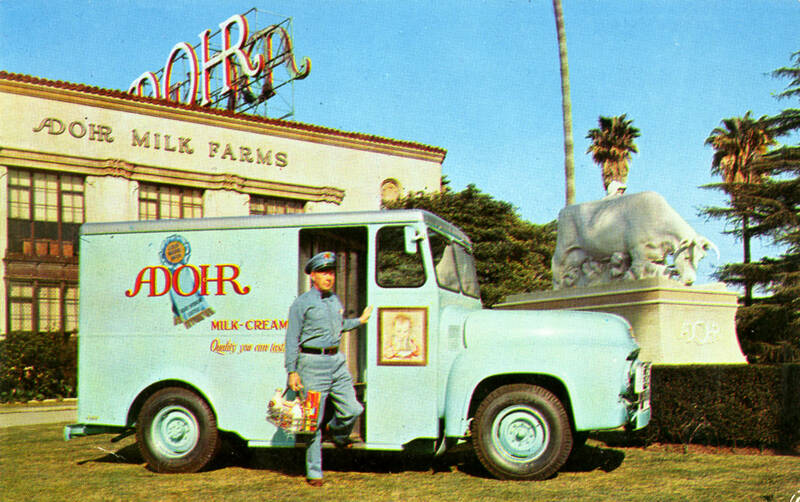 The Adamsons also owned Adohr Milk Farm (a.k.a. 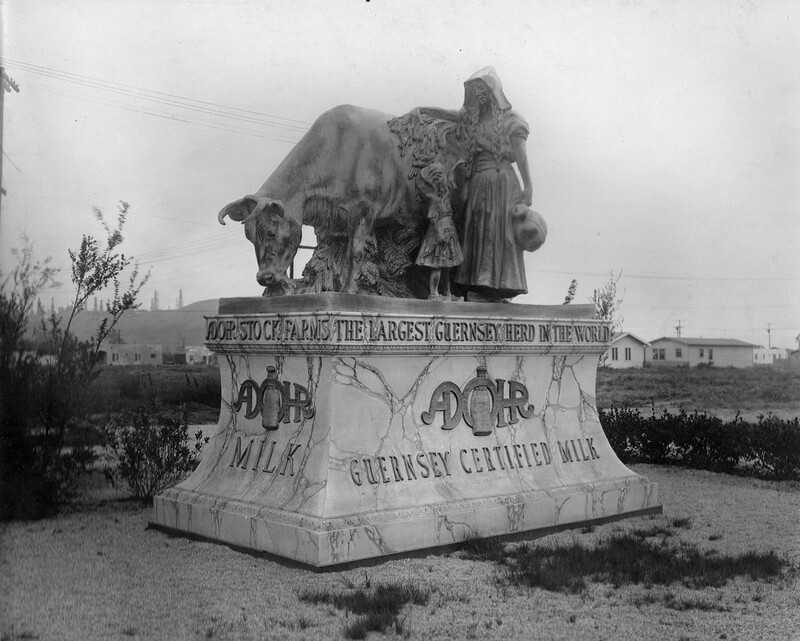 Adohr Stock Farms) at 18000 Ventura Boulvard in Tarzana ; in the 1920s, it had the "largest pure-bred herd of Guernsey cattle in the world." ( L.A. Times, Aug. 22, 1926 .) 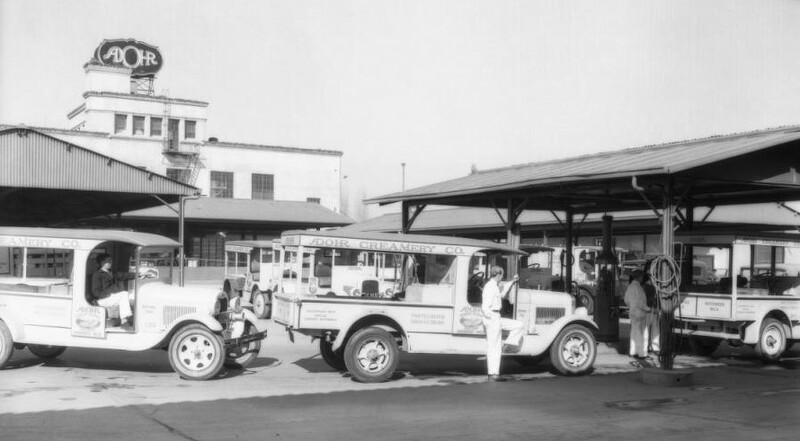 The Rindge-Adamson family owned and operated the Adohr enterprises (named for Rhoda – her name spelled backward) between 1916 and 1966. One of the Adohr cow and milkmaid sculptures. Photo from the Danton Burroughs Memorial Site & Family Archive ( showing several such examples of these common sort of advertisements ). 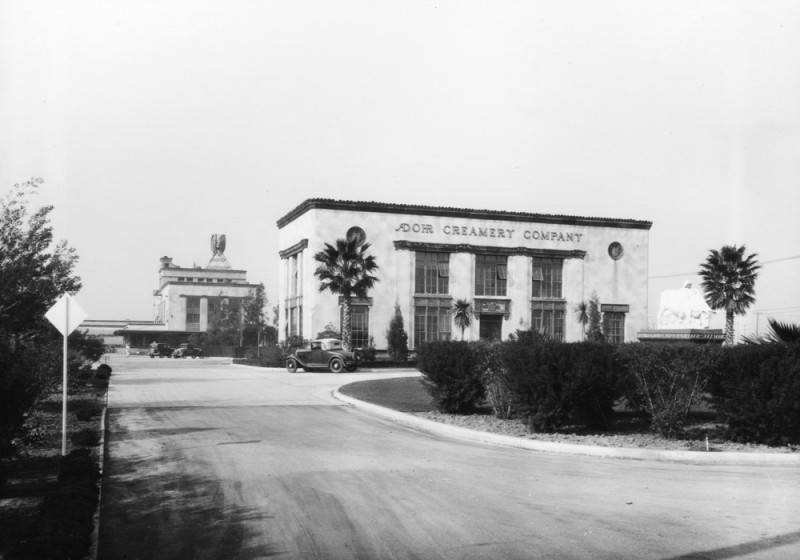 The Burroughs site, covering Tarzana history, says, "T his sculpture was later painted white while placed in front of the Adohr Creamery located at 1801 South La Cienega Boulevard (ca. January 1931). Note the La Brea oil wells along the left horizon." The surviving Adohr sculpture is outside Suputo, Inc. 's Morningstar Foods dairy plant at 605 North J Street, Tulare, California. 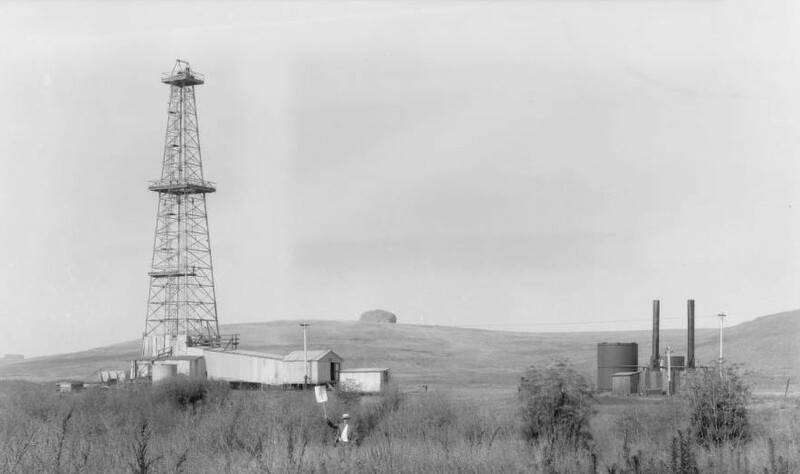 In March 1910, the Herald reported that a court would allow the Frederick Rindge estate to lease Lots 7 to 11 of the Arnaz tract to West Coast Oil for twenty years in exchange for "one-sixth of all the oil and gas produced." It is unclear what came of that drilling. Without many neighbors, there did not appear to be much controversy or reporting. That would change in the next decade. July 17, 1928, Fairchild Aerial Surveys photograph (for Standard Oil Company). The Arnaz ranch house is just below the center; Adohr Creamery is to its far right (at La Cienega Boulevard S-curve ); Benedict Channel (draining Benedict Canyon ) runs along the left; and the Pacific Military Academy is at bottom left. (Photo courtesy UCSB Library Aerial Photography Collection . The below 1934 L. A. Herald article ( pasted in the Monte-Mar Vista/Cheviot Hills American Legion post's history scrapbook ) tells of the post and Harry Culver's California Country Club fighting oil drilling on Marblehead's Arnaz Ranch. Mr. Culver's 3 1/2 acre Castle Heights estate adjoined the country club and was south of the ranch. Before the decade's end, drilling opponents would win, tolling the end for Marblehead's Arnaz ranch. In 1939, the remaining 330 acres of Arnaz ranchland were sold by the Marblehead Land Company to make way for Beverlywood. It was a transaction between some of the biggest landowners of the past century, whose fortunes turned on oil. The buyers were scions of the Dominguez family – heirs to the Rancho San Pedro grant whose fortune was made in oil. The Rindge family, one-time owners of the Rancho Topanga Malibu Sequit and once among the wealthiest in the world, lost the right to drill for oil on the Arnaz tract, so they had to sell it amid the pressure of the Great Depression. In 1938, they'd lost control of their Malibu ranch when their Marblehead Land Company was reorganized in bankruptcy. ( L.A. Times, June 30, 1938 .) 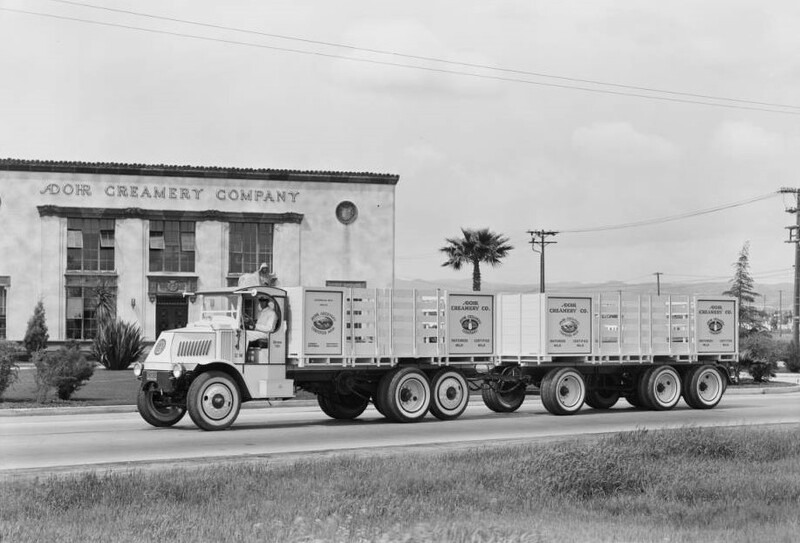 Their Adohr Creamery remained until 1966. [D]uring the depression years, Mrs. Ringe’s empire began to collapse under its burden of taxes. Her holding company, the Marblehead Land Company, ran into serious financial difficulties. But the old Arnaz rancho Mrs. Ringe held onto stubbornly. Several years ago the company saw a prospect of developing the land as an oil field. Surrounding residents raised such a storm of protest, however, that the city council and planning commission of Los Angeles finally rejected the proposal by narrow margins. Recall of Mayor Shaw and ousting of his brother, Joe, put an end to oil-drilling schemes in the area. "[A] group of prominent Los Angeles financiers – whose names for various possible reasons [were] not being disclosed – formed the Beverly-Arnaz Land Company to the purchase the tract for $750,000." ​​The Dominquez family (among them Carsons, Del Amos, et al.) was unusual in that they had held on to most of their Rancho San Pedro land grant, rather than subdividing or losing it to litigation expenses or taxes. ( Rancho San Pedro covered over 120 square miles: today's Carson, Compton, Gardena, Hermosa Beach, Lomita, Manhattan Beach, Palos Verdes Estates, Rancho Palos Verdes, Redondo Beach, Rolling Hills, Rolling Hills Estates, Torrance, the western portions of Long Beach and Paramount, and the Los Angeles communities of Harbor City, Harbor Gateway, San Pedro, Terminal Island and Wilmington.) While rents may have kept them comfortable, they became extraordinarily wealthy after oil was discovered under their land. They sold their oil and rented land for tank farms and refineries, hold it all through family corporations. Their oil wealth enabled them to buy the Rindge/Adamson family land - even if they could not drill on it. There was (or would be) oil drilling and production on nearby Hillcrest Country Club and Cheviot Hills Recreation Center. In 1939, H. H. Cotton and H. H. Jarrett headed a syndicate formed to purchase property known as the Arnaz Tract from the Marblehead Land Company, owned by Malibu heir and Los Angeles benefactress Rhoda Rindge Adamson. In April, 1939, the syndicate incorporated as the Beverly-Arnaz Land Company, with Cotton as President and Jarrett as Director. Also on the board was noted Los Angeles developer Walter H. Leimert. By 1940, the Arnaz Tract was being developed as Beverlywood, a subdivision located near Beverly Hills and what is now Century City in the Los Angeles area. The company was voluntarily dissolved in 1946 and its assets liquidated. 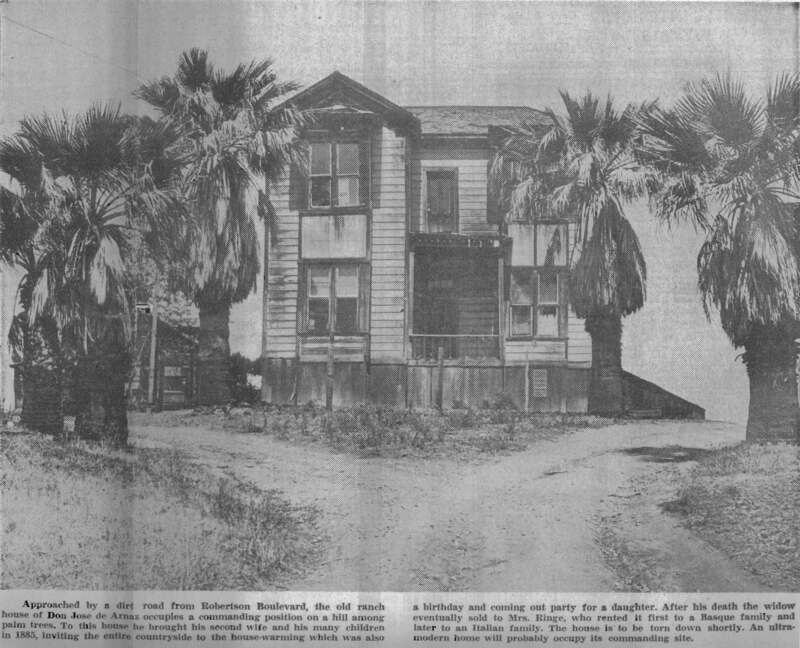 Hamilton (H. H.) Cotton was a Monte-Mar Vista resident – something advertised by the Monte-Mar Vista tract's developers in 1925 . Cotton was another founder of San Clemente, together with Ole Hanson ; the latter had a hand in developing Monte-Mar Vista and was friends with Cheviot Hills developer Frans Nelson. Cotton's 1926 San Clemente house, La Casa Pacifica , became President Richard Nixon's Western White House. Hardin (H. H.) Jarrett may have been familiar with the Arnaz ranch from his time working for the nearby Hauser Packing Company. Oil production finally did come to the Arnaz Ranch. 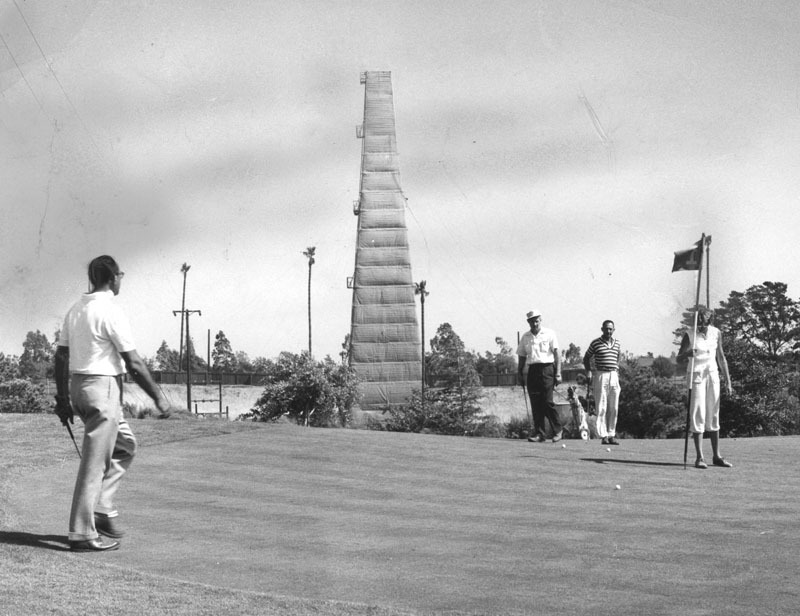 With slant drilling in the 1950s, the pools of oil under Arnaz' land would be extracted from wells on the Rancho Park Golf Course and Hillcrest Country Club. It was not without controversy tied to the Marblehead Land Company, which “[s]old to Beverly-Arnaz with the provision that if oil is produced, the property would revert back to Marblehead Land.” ( L.A. Times Sept. 14, 1958 .) “Sold to Beverly-Arnaz with the provision that if oil is produced, the property would revert back to Marblehead Land.” (Ibid.) In the end, the matter was resolved without any reversion. On July 26, 1949, the Arnaz Addition annexed to the City of Los Angeles "93 acres and 2400 citizens" after "the citizens of Arnaz voted 489 to 101 to become part of Los Angeles." Don José had bought his first interest in the land one hundred years before. Today, Arnaz Drive (traversing Los Angeles & Beverly Hills) is the last local marker – though it is more often linked (wrongly) to Desi Arnaz than to Don José.